I have finally managed to sort through all my photos from this weekend (woo, there are a lot!) 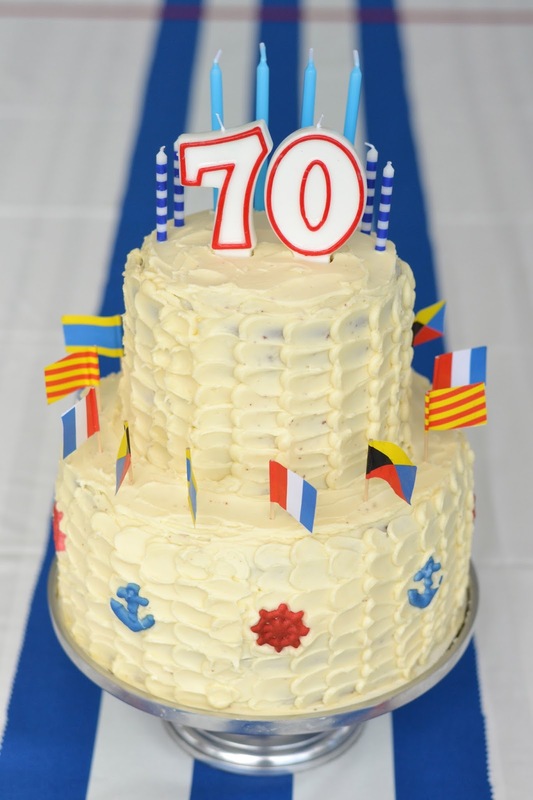 and I am very excited to share all the fun DIY projects I have been working on for my Dad's nautical birthday party over the last several weeks. Hope you are ready for some major crafting, because this week is party week!Without further ado let me present the centerpiece of any good party: the cake! My mom and I decided to have the party catered but, being an amateur pastry chef, I wanted to take responsibility for the dessert. 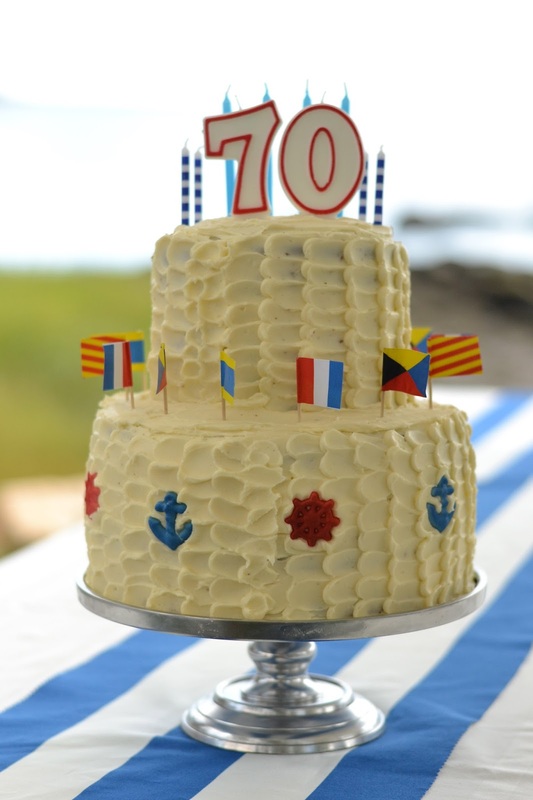 I had a vision for a sweet nautical cake and, as you can see, I got pretty into it. Care to make your own version? Let me give you my insider tips!size and shape | I prefer round layer cakes as they can be put on a pretty pedestal (this one was from Crate & Barrel several years ago; similar one here) for an optimally professional display. To make this cake I used three pans each in two different sizes: nine inches (buy here) and six inches (buy here). To prepare the pans butter the bottoms and sides; sprinkle flour all over the buttered sides and tap off the excess; cut a round of parchment paper and place in the pan (trace the bottom of the pan with a pencil and cut just inside those lines; fits perfectly every time!). Another key to making a layer cake is to shave the top of each layer so that they are flat and can stack easily. Also, another insider secret is to stick several wooden dowels down the middle of the cake to anchor the layers to each other and keep everything upright. It works like a charm!recipes | Let me share a dirty little secret: I don't make the cake batter from scratch! Scandalous, I know! You can certainly do that, and I have had good results from a completely homemade cake, but when you are going to be spending a lot of time on the decoration I recommend a quick little shortcut: cake mixes. Specifically I used three boxes of Devil's Food cake mix and folded in a bag and a half of high quality semi-sweet chocolate chips (I prefer Ghiradelli) right before pouring the batter into the pans. The chocolate chips make for a nice change in texture from the rest of the cake and up the chocolate factor exponentially. For the frosting I just made a basic buttercream, doubling this recipe but cutting the proscribed sugar in half. You can use your best judgment for the sugar input, just keep tasting it as you incrementally add the sugar and stop when it's at your desired level of sweetness.decorations | To make the scalloped effect on the side of the cake, I followed this easy instructional. 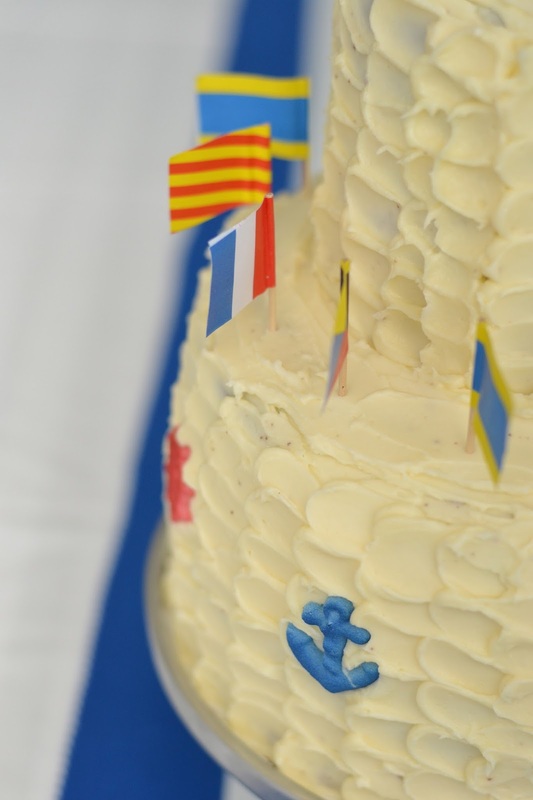 I decorated the sides of the bottom layer with these sugar pieces and then topped it with these signal flag toothpicks. 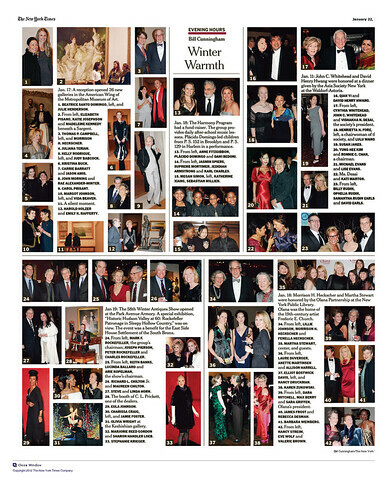 I then topped the whole thing with an array of striped, blue, white and red candles. The overall effect was perfect for a seaside party for a classy man like my Dad.What do you think? Would you try a big party cake like this? Do you have any baking tips to add?